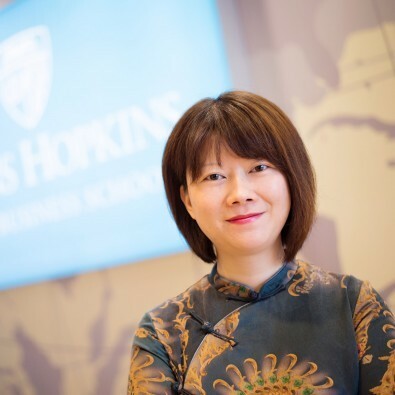 Xian Sun, PhD (Finance, Rensselaer Polytechnic Institute) joined the Johns Hopkins Carey Business School in 2009. She is an Associate Professor in the practice track with expertise in the areas of emerging capital markets, institutional shareholders, and mergers and acquisitions. Patro, D. Siddique, A., and Sun, X. 2013. Stress testing for market risk. Stress Testing: Approaches, Methods and Applications. Risk Books. Liu,Q., Sun, X., and Wu, H., 2018. Premier Advisory Services for VIP Acquirers. Journal of Corporate Finance. Forthcoming. Sun, X., Gunia, B., 2018. Economic Resources and Corporate Social Responsibility. Journal of Corporate Finance 51, 332-351. Sun, X., Lee, S., Phan, P., 2017. Family Firm R&D Investments in the 2007-2009 Great Recession. Journal of Family Business Strategy. Forthcoming. Hasan, I., Khalil, F., Sun, X., 2017. The impacts of intellectual property rights protection on cross-border M&As. Quarterly Journal of Finance 7. Ma, M., Sun, X., Waisman, M., Zhu, Y. 2016. State ownership and market liberalization: Evidence from China's domestic M&A market. Journal of International Money and Finance Available online July 2016. Francis, B., Hasan, I., Sun, X., Wu. Q. 2016. CEO Political Preference and Corporate Tax Sheltering. Journal of Corporate Finance 38, 37-53. Hasan, I., Siddique, A., and Sun, X. 2015. “Invisible" Hand of Market Discipline: Capital Adequacy Revisited. Journal of Banking and Finance 50, 475-492. Francis, B., Hasan, I., Sun, X., Waisman, M. 2014. Can Firms Learn by Observing? Evidence from Cross-Border M&As. Journal of Corporate Finance 25, 202-215. Francis, B., Hasan, I., and Sun, X. 2014. The certification role of financial advisors in cross border M&As. International Review of Financial Analysis 32, 143-158. Francis, B., Hasan, I., and Sun, X. 2014. Does relationship matter? The choice of financial advisors. Journal of Economics and Business 73, 22-47. Patro, D., Qi, M., and Sun, X. 2013. A Simple Indicator of Systemic Risk. Journal of Financial Stability 9, 105-116. Kobeissi, N. and Sun, X. 2010. Ownership Structure and Bank Performance: Evidence from the Middle East and North Africa Region. Comparative Economic Studies, 52, 287-323. Francis, B., Hasan, I., Lothian, J. and Sun, X. 2010. The Signaling Hypothesis Revisited: Evidence from Foreign IPOs. Journal of Financial and Quantitative Analysis, 45, 81-106. Kobeissi, N., Sun, X., and Wang, H. (2009). Managerial Labor-Market Discipline and the Characteristics of Merger and Acquisition Transactions. Journal of Business Research. 63, 721-728. Francis, B., Hasan, I. and Sun, X. 2009. Political Connections and the Process of Going Public: Evidence from China. Journal of International Money and Finance, 28, 696-719. Francis, B., Hasan, I. and Sun, X. 2008. Financial Market Integration and the Value of Global Diversification: Evidence for US Acquirers in Cross-Border Mergers and Acquisitions. Journal of Banking and Finance, 32, 1522-1540. Francis, B., Hasan, I., and Sun, X., CEO Compensation and Covenant Violation. Submitted. Francis, B., Hasan, I., Liu, Q. and Sun, X. Creditor Control and CEO Compensation. Francis, B., Wu, Q., Sun, X., Do talented managers avoid more taxes?